McCain South Africa has relaunched its McCain Crispy Oven Chips range, with new branding and some recipe changes. “The new Crispy Oven Chips range is bringing crispiness back to kitchens across South Africa. There is nothing more satisfying than biting into a crispy chip and having the inside be soft and fluffy, the new Crispy Oven Chips range offers just this. Not only are McCain’s new Crispy Oven Chips crispy but they also have a great new look, while the thicker and longer steakhouse cut will have the whole family wanting more. 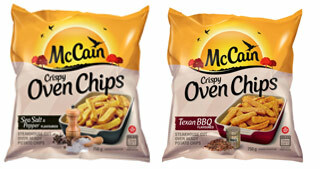 McCain is proud to be the first in South Africa to introduce two delicious new Crispy Oven Chip flavours. The two flavours include a spicy Texan BBQ, which has a delicious smokey flavour, and Sea Salt and Pepper which has a subtle taste of cracked black pepper and sea salt. ‘We are excited about our new Crispy Oven Chips! This range of chips not only delivers on a crisp delicious taste, but it will also fit into moms’ and kids’ lifestyles. We do however feel that it is necessary to let mom know about the after effects of trying our new Crispy Oven Chips – the chips taste so good that the kids are not going to want to share with anyone, not with dad, not with their siblings, not even with their pets. This means that mom might have to start stocking up on them to keep everyone happy,’ says Deolinda Da Costa, marketing manager of McCain South Africa.